I've been calling my tutorials "bookbinding 101" so I really should have done this particular tutorial first. I spend a substantial amount of time worrying about paper grain direction when I'm making my books. So, as far as I know, all machine-made papers have a grain direction. This applies to standard printer paper, cardstock, drawing paper, watercolour paper, etc, as well as binder's board or other boards. 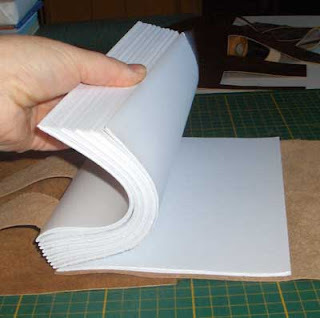 Basically every paper material that we use for making books – except handmade paper. So the grain is a result of the way the fibers align during the paper making process. With handmade paper, the fibers are all over the place so there is no grain. But machine made paper will have the fibers all aligned in the same direction. Sometimes if you have some classic laid paper or other nice paper, you can see the lines. The lines that are really close together are along the grain – then the perpendicular lines that are spaced several inches apart are against the grain, I believe those lines show where the paper was laid...so, classic laid... I'm composing this from memory of my bookbinding classes with Joe Landry and Stephanie Dean-Moore, from 5-6 years ago, so hopefully my memory isn't too faulty. It is important to be aware of the paper's grain direction so that your books close properly, and so they will open properly, and so the spine will keep its shape, and so the boards don't warp, etc, I'm sure there are many many more reasons. The direction of the paper grain should always always always be parallel to the spine of the book. So the first part of my tutorial will focus on how to determine the grain direction of a piece of paper. I've never met a paper that I couldn't figure out. I always start with this test and it usually works. 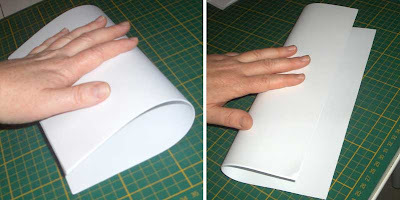 Just lightly bend the paper over and push down a little bit on the curved fold – without actually making a crease. Then lightly fold it the other way and press on it. Whichever direction presents the least resistance when you press lightly on the curved fold, then that is the grain direction. In these photos, I’m using standard 8.5" x 11" printer paper. It is always grain long – so when I bend it the long way (photo on the right), it is very easy to bend and there is much less resistance compared to when I tried it the other way. If Test 1 doesn't tell you for sure, I will let the paper hang over the edge of the table. Place the paper at the edge of the table, about half on and half off. Look to see how much angle there is where the paper bends. Then turn the paper around and do it again. Whichever direction has the most bend to it, then that is the direction of the grain. In this photo, the paper in the foreground is bending along the grain. The paper in the background is bending across the grain so it doesn’t flop over the edge of the table as much. This was difficult to photograph but sometimes the difference is quite dramatic so if you try it, it can be quite obvious which direction is along the grain. This test requires that you destroy the paper, but it is quite reliable. Simply try to tear the paper straight down the middle. If it tears in a relatively straight line, then the tear is parallel with the grain - shown here by the black arrow. 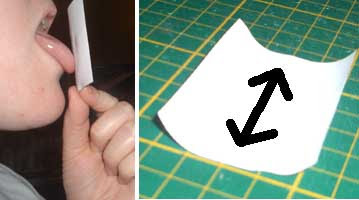 If you get a curved tear, or it is just impossible to go straight when you rip the paper, then you are tearing across the grain. If all else fails, I lick the paper. Cut off a corner and note its orientation – so I mark the long and short direction on it usually. Then just lick it, and place it on the table. Because it is damp, it will curl. The valley of the curl will be parallel to the grain direction, shown here by the black arrow. The key with this test is to remember how this little corner fits back onto your larger sheet of paper, otherwise the test isn't very helpful! I have created two book blocks that are the same size, but one has the paper grain intentionally going the wrong way. I have bound both of these book blocks because I was hoping to show how much incredibly better the 'good grain' book functions. The pages just lay so nicely in comparison to the book with the bad grain. Oh, just look at the beautiful open-book-shape of the good-grain book here. Other book…not so beautiful. One thing that I really like is the fanning of a book's pages. Having the grain direction going the wrong way just devastates this wonderful feature of a book – it is more likely to just spurt in chunks rather than perform a lovely fluttering fan. I made a brief video of this fanning process to more effectively show the difference. So in this clip, the bad sputtering book is shown first, followed by the nicely flowing fanning book. I haven't been doing many hardcover books lately so when it comes to paper grain, my primary concern is with the book block; however, the paper grain factor just grows and grows when a hard cover is introduced. I am not working on any hardcover books right now so I don’t have photos for this next part, but let me try to explain why it is important to be aware of the grain direction when making a hardcover book, and how it can be very useful too. Binder's board can be tested for grain direction by just trying to bend it, so you can feel which way bends easiest. Or if you have a really big sheet of board, laying it half on and half off the table and checking to see how much it bends over the edge of the table will work too (like test 2 described above). The grain direction of the binder’s board needs to be parallel to the spine, just like the grain direction of the book block. It is important to make sure that the grain direction of your covering paper is also parallel to the spine. Papers expand when they are wet, and they usually expand more across the grain. So if you spread paste onto a piece of decorative paper, it will be slightly larger after it absorbs the moisture of the paste. This expansion will be most noticeable across the grain. So when you put this wet paper onto the binder's board, then let the paper dry, the paper shrinks back to its original size…pulling the edges of the binder's board with it as it shrinks…causing the warp. 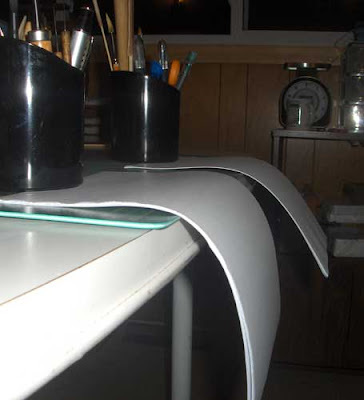 Now if you apply past to another piece of decorative paper and adhere it to the other side of the binder's board and let it dry, when that second piece of paper shrinks back to its original size, it will pull the board in the opposite direction and make the whole thing flat again. No need to press while drying! But this will only work if the board and both pieces of paper all have the grain directions parallel. Also, it will be most effective if the two pieces of decorative paper are the same kind of paper, so that they react the same and expand the same amount when damp. If the two pieces of paper are quite different in weight or density, then one piece might expand a lot more than the other thus not pulling the board back perfectly flat while drying. If the papers are not the same, then the boards should be pressed while drying, but even pressing boards will not guarantee that they won’t warp now or at some point in the future. Keep the grains parallel to the spine all the time, always. Your book will open better. The pages will fan nicely and lie open flat. The covers will dry flat. The spine will be stronger. The entire book unit will be more cohesive. The book will have a longer life. I sure hope that this makes sense to anybody who is trying to learn about paper grain. Or for anybody that already knows about this stuff, please let me know if I haven’t presented it clearly. Hi Rhonda, funny you're writing about paper grain - I was about to post something about it in my blog as well :) Very well done! ...is it bad that while i've considered board grain before, that i never really thought about paper grain? Maiko, maiko, maiko! You are forgiven. Hmmm, i've been doing this bookbinding thing for about 6 years, made a trillion books, and have never utilized a paper cutter. Should I have a paper cutter?? hahaha i have no idea! but since i'm lazy and have just been folding 8 1/2" x 11" paper in half (if i don't tear the sides first), i would probably see about buying 11" x 17" and chop those in half before folding them in another half XD if i could get some nice slicey machine to cut a bunch at a time, that would be awesome! ...and expensive haha. Now I know what Im doing wrong!! man, I've been second-guessing myself about the grain of niddegen all morning. 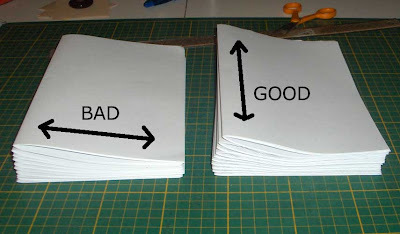 I'm pretty clever, but when it comes to binding books, I am sort of paranoid about doing things wrong...and backwards! very helpful post. best of luck! Awesome! I am taking the CBBAG bookbinding 1 right now! Thanks for this great article on grain. Thank you! This was VERY helpful! Especially about the hardcover books. Hi, I was just wandering, with the hard cover, and the two paper's... How would you put them down onto the board? I mean, do you put one on top of the other so you have two layer's, or are they half and half lying next to each other, over lapping, or what? Sorry I'm sure that it would be clear to anyone else, I'm just really new to Bookbinding so I'm a bit confused. Saaski, one paper is pasted to the book board, then the other paper is pasted to the other side of the book board. OOh! Ok. I get it now. Thank you. P.S I have put a link to you on my Blog "The Bookbinders Apprentice". I hope you don't mind. I'm Just getting started and I thought your blog would be a very good reference link. Yes, Sonya, you can link to this post! Thanks a lot! I've followed your directions & the result was great!! !